Then the unthinkable happens: the forecast shows rain, a lot of it. Now what? You panic. Rain means no outdoor pictures! Instead all pictures have to be inside! God, how do we take the group shots? A dirty wedding dress. Umbrellas everywhere. No light. You think that you have really bad luck with this one! After all sunshine represents happiness, right? According to the UK Met Office, the average rainfall in Britain is 1,154mm per year. On average it rains for 156.2 days per year (data from 1981 to 2010). Wrong. 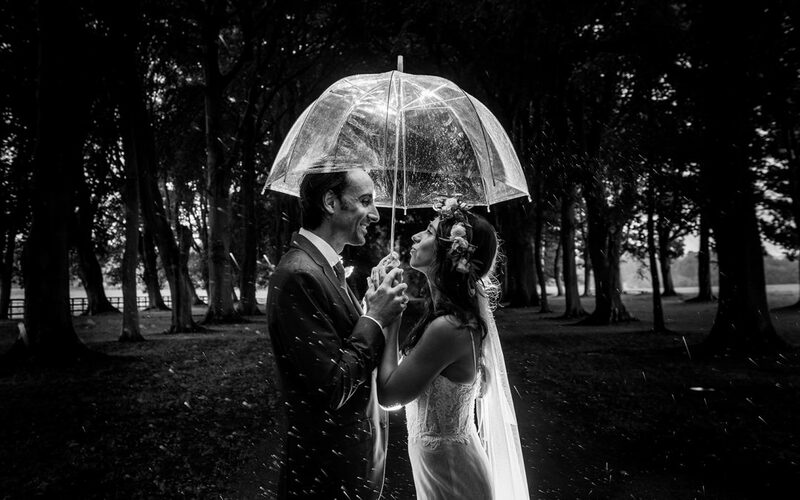 Rain on your wedding day does not have to be the end of everything. There is an important saying: “A wet know never comes undone”. Also In many cultures rain symbolises fertility, cleansing and good luck! So how do I deal with rain on your wedding day? Having photographed well over 100 different weddings, I have encountered all sort of weather situations and have extensive experience when it comes to getting the shot even if there is (a threat of) rain. Here are eight top tips! 1.) When it rains it doesn’t pour. Let me say that in seven years of wedding photography I have never photographed a wedding where it rained literally all day and therefore made the outdoors a complete no-no. Unless you get married during the stormiest winter season of the year, it generally rains intermittently and there will be breaks in the rain. This is the absolute key! It is all about being flexible and seizing (photo) opportunities with an eye on the sky. The emerging storm is creating a very dramatic dark backdrop the the front that is still lit in sunshine. Take all the photographs inside you might say. I can do that but only if I absolutely have to. Keeping in mind that most venues do not offer the right kind of space for larger formal group shots. In my mind a good wedding reportage consists of indoor as well as outdoor pictures. Outdoor offers much better natural and non-directional light, more space, better settings. One the left you see the family covered by the front of the venue, on the right the finished shot. I also monitor the weather and potentially liaise with you the day before the wedding to possibly change some of the stuff we had agreed on. For example if all formal group shots were planned for the time between the ceremony and the reception, but the evening promises better weather than we can simply do those pictures later in the day, as long as you allow time for it (maybe push your first dance back by half an hour). One October wedding I photographed had a lot of rain forcasted for the day. Thankfully Igor & Georgia were flexible and allowed me to take all necessary pictures in the gaps between rain showers. This meant they cut their greeting line short to rush outside for their confetti shot in order to get the shot in sunlight with black rain clouds approaching. Once it started raining they moved inside and enjoyed a few drinks and chats with guests. Half an hour later the rain stopped and we went outside for portraits. Everything was sparkling from rain! 4.) Be quick & clever. Umbrellas can be removed in the last second. 5.) Seek shelter that’s not obvious. Couples can be positioned in sheltered spots for example in some woods where the trees protect from the rain. Rainy weather can create some amazing and unique photo opportunities. Have some fun and don’t feel too miserable about the weather. 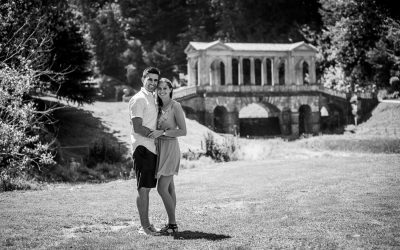 Catching up on some of last year’s special shoots, here is another surprise engagement session at Prior Park in Bath for you. 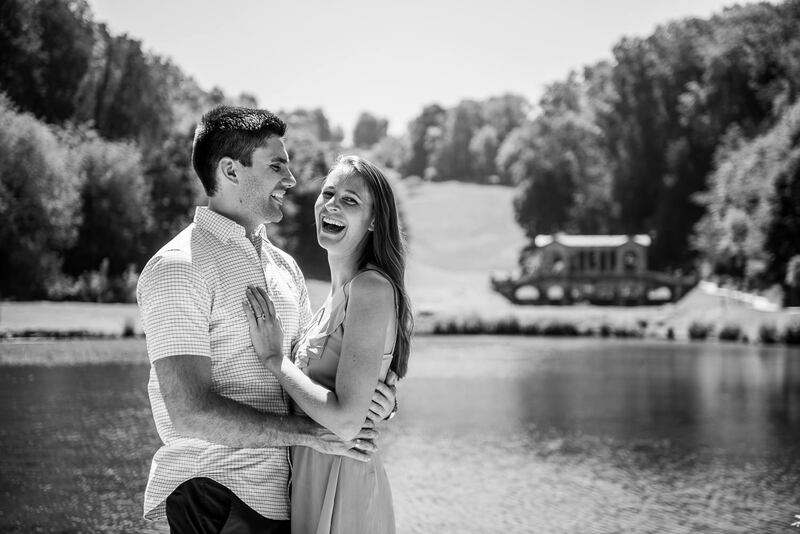 I shot four surprise engagements there last summer! Mohammed was very keep to propose to his beautiful girlfriend Yasmin and as always, when planning a surprise engagement, I put a lot of work and planning into the preparations to make sure I am at the right place at the right time without the girlfriend getting wind of pur plan. We succeeded, Yasmin said yes, was a little overwhelmed for a while and then did an amazing modelling job for me. The picture of the two of them in the sunshine with both the bridge as well as house in the background is one of my 2018 favourite shots! 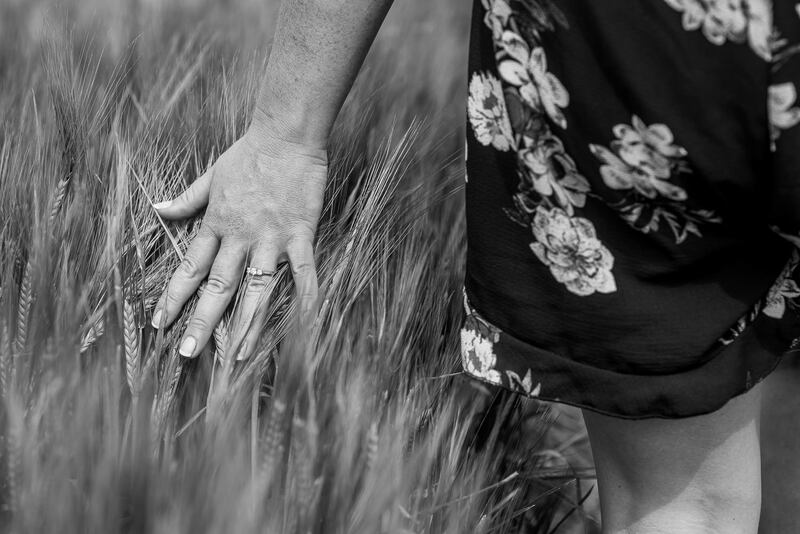 Side note: the four pictures at the beginning of this blog post are of the real proposal. The two pictures at the very top of the blog post were posed.